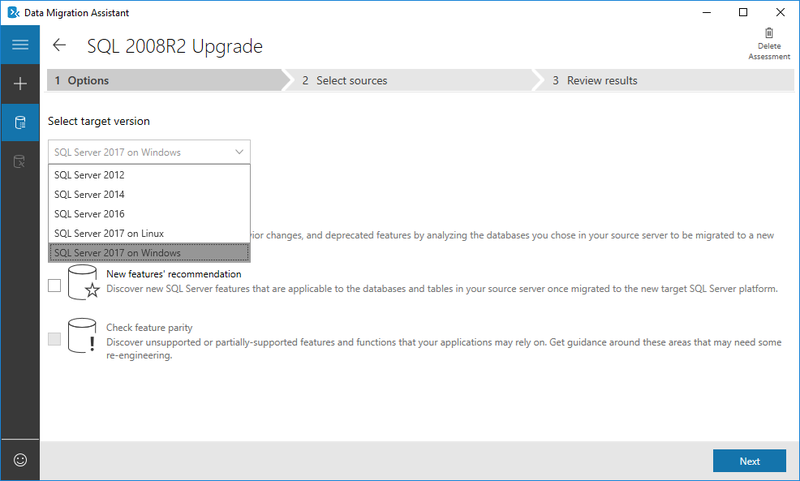 One of the recurring questions I see on Stack Overflow is "How do I restore a SQL Server backup to a previous version of SQL Server?" The answer, of course, is you don't. Upgrading a database to a newer (major) version is a one-way ticket--at least as far as the database files and subsequent backups go. I recently found myself in a similar position as all those hapless Stack Overflow questioners. I had a customer that had migrated to a newer version of SQL and they wanted to roll back to the previous version. What to do? A couple of thoughts immediately came to mind. There's the SQL Server Import and Export Wizard and the Generate and Publish Scripts Wizard. Neither of these sounded convenient. In particular, generating a script with both schema and 500 GB of data sounded like a fruitless endeavor. Two other options sounded much more appealing. So I focused on those. The first was the Export Data-tier Application, which would create a BACPAC file from the newer version. In theory, I would be able to import that to a lower version of SQL Server. I started the wizard from SSMS, made two simple choices (name and path of the file, along with the list of tables I wanted) and clicked "finish". Any optimism I had was short lived. My database had cross-database references in numerous views and stored procedures. The BACPAC export failed. Much to my surprise, I found no option to pick and choose what objects (other than tables) were to be included/excluded with the export. On to plan B. This seemed to work fairly well for a smaller database about 15 GB. In the end, all of this ended up being an academic exercise. The customer ultimately decided to stay on the newer version of SQL and I never did downgrade the large 500 GB database. When I first realized the challenge ahead of me, I sought out some advice from the community. Special thanks to Peter Schott, Constantine Kokkinos, Enrique Argüelles, and Patrick (aka "Paddyrick" on Slack) for all the healthy discussion and sharing. 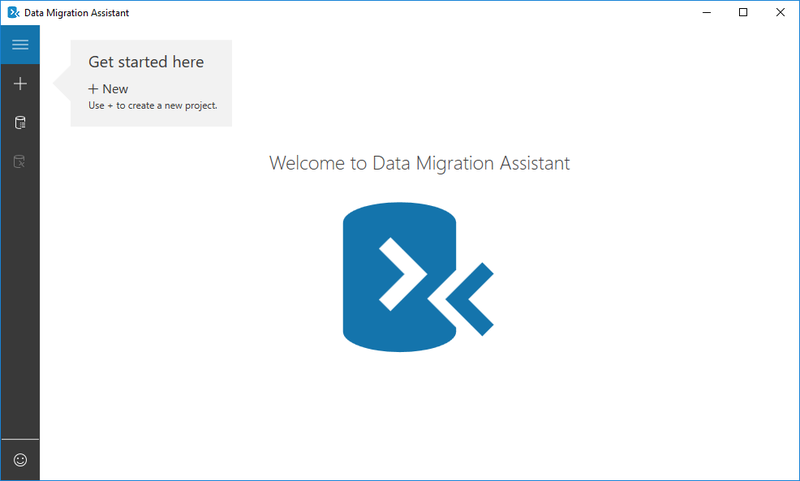 I recently took advantage of an opportunity to try Mirosoft's Data Migration Assistant. It was a good experience and I found the tool quite useful. 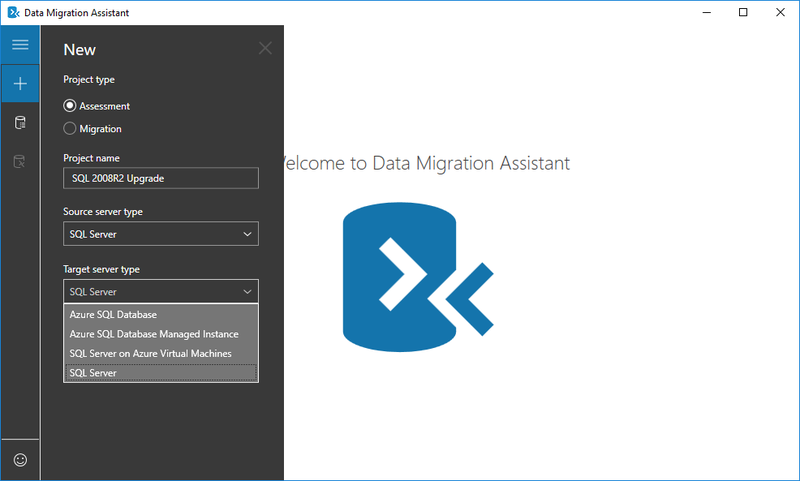 As the documentation tells us, the DMA "helps you upgrade to a modern data platform by detecting compatibility issues that can impact database functionality in your new version of SQL Server or Azure SQL Database. DMA recommends performance and reliability improvements for your target environment and allows you to move your schema, data, and uncontained objects from your source server to your target server." 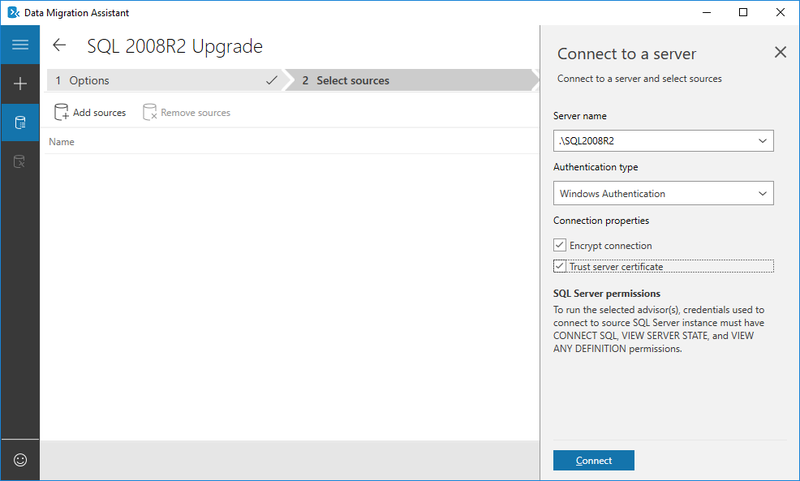 For my use case, I wanted to assess a SQL 2008 R2 environment with more than a hundred user databases for an on-premises upgrade to SQL 2017. There's not much to the Welcome screen. Simply click the + button as indicated on the left side toolbar. Clicking next brings us to the Options page. Choices here will vary slightly, based on the Target server type. Note the target versions listed--the oldest supported target version is SQL 2012. 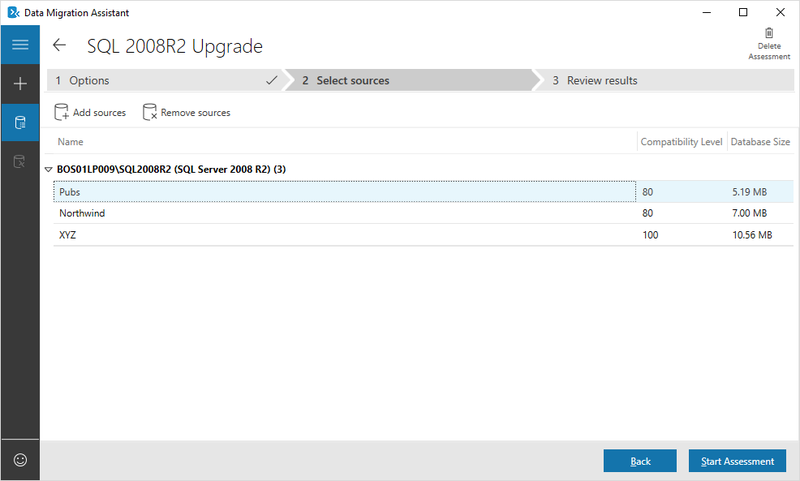 But since SQL 2008 and SQL 2008 R2 fall out of support soon, that's fine by me. For the report type, I was only interested in Compatibility issues. 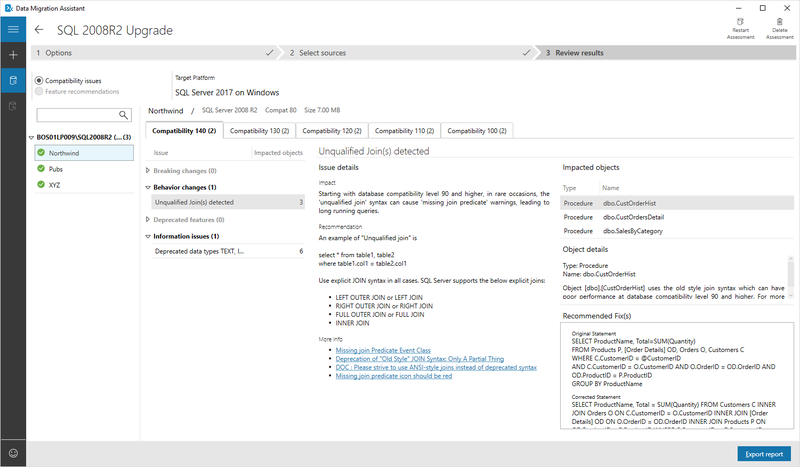 On the next screen, specify the SQL instance to connect to, and one or more databases to assess. (If you want to assess databases from more than one instance, additional sources can be added by clicking the "Add sources" toolbar button/icon.) Here, I specified a named instance on my local machine, and chose 3 of the five user databases. Review the choices and click Back to change them, or click Start Assessment. I'll go with the latter. There are some animated gif-like graphics while the assessment is running. By default, the app will use up to eight threads/connections (this behavior can be controlled by a parameter in the dma.exe.config file). 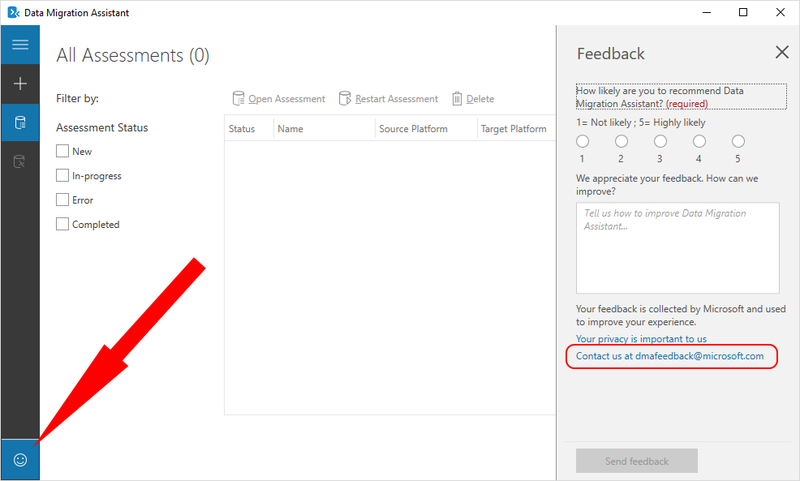 Clicking/selecting a specific issue shows the Issue details, Impacted objects, and Recommended Fix(es). In the example here, there were only two issues found: unqualified joins and deprecated data types. 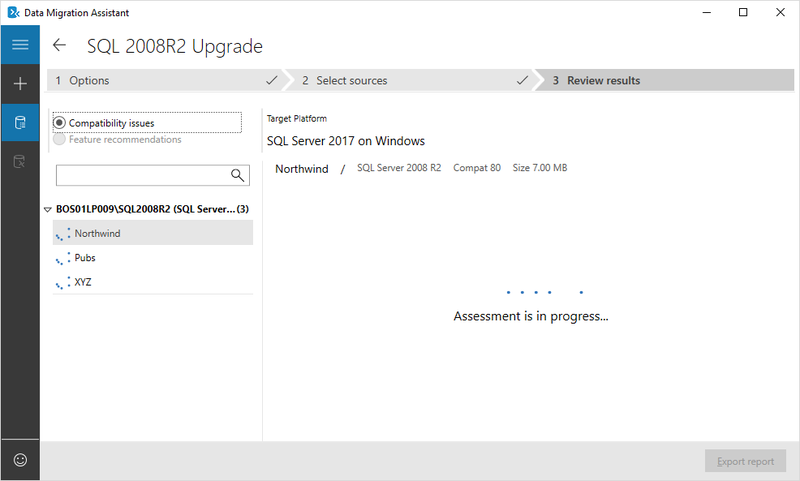 There are tabs for multiple versions of SQL Server, from 140 (SQL Server 2017) downward. These show the impact of each issue, depending on what compatibility level the database would be placed in after an upgrade or migration. 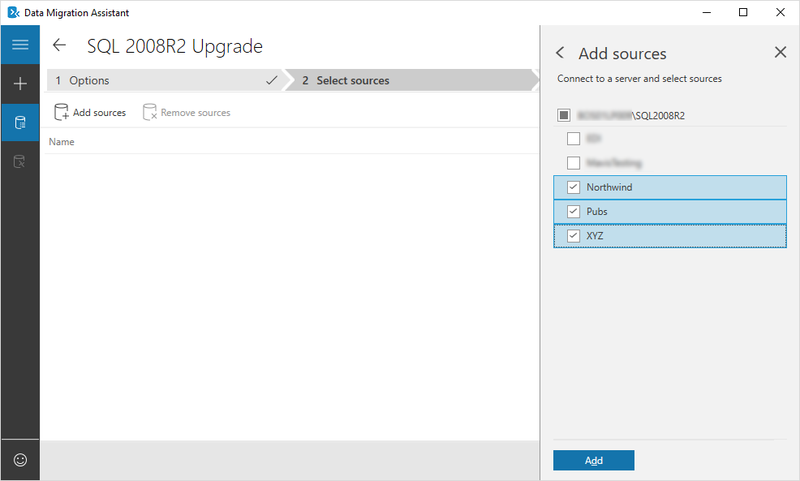 That both issues are present across the board tells us we can't make either issue "go away" by running the Northwind database on SQL 2017 in any of the lower compatibility levels. Remove references to undocumented system tables. SET ROWCOUNT used in the context of DML statements such as INSERT, UPDATE, or DELETE. Full-Text Search has changed since SQL Server 2008. ORDER BY specifies integer ordinal. CLR assemblies marked as SAFE or EXTERNAL_ACCESS are considered UNSAFE. Constant expressions are not allowed in the ORDER BY clause in 90 or later compatibility modes. 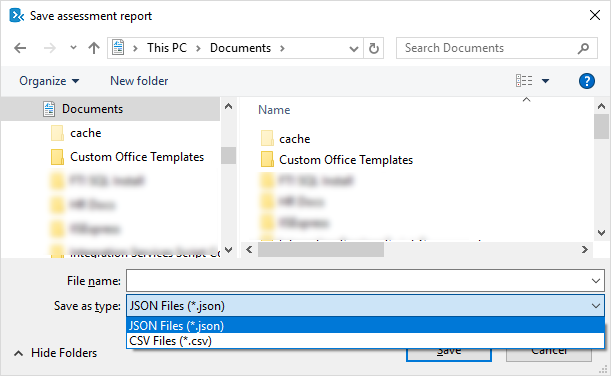 You can export a report to either a *.csv or *.json file. I didn't find either that helpful (I created a *.csv report file and opened, edited, and saved it as an Excel spreadsheet), although either can be ingested by Power BI. The little smiley icon in the lower left is for user feedback. I clicked it and submitted a few items. Along the way, I also encountered an error with three databases that prevented the assessment from completing. I ended up contacting Microsoft via email. To my surprise, I received a response in less than an hour. 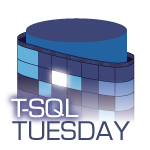 They surmised there was a stored procedure in each database that caused the error. Removing it enabled the assessment to complete successfully. Thanks, Microsoft! SQLSaturday #859 in Tampa was my first event for the year. 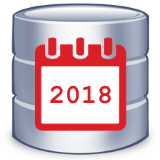 It unofficially begins "SQLSaturday season" for me. There's a handful of events in Florida and the Southeast that are relatively close and at agreeable times of the year. But back to Tampa--this was just my second time at their event, and I'm sure I'll be back again. I debated driving to Tampa on Friday vs driving on Saturday morning. Take my time and spend for a hotel or be in a rush, but save some money. I opted for the latter. I stayed up late Friday night watching basketball and I paid the price on Saturday--I was tired. Traffic on I-4 was surprisingly good Saturday morning, and I arrived with plenty of time to spare. I like the venue in Tampa, which is on the campus of USF. There's plenty of parking outside, and plenty of space inside, including numerous tables & chairs. It's great to have a place to sit and relax, whether it's breakfast, lunch, or just networking. I won't speak for the vendors, but it looked like they had enough elbow room too. There was one session in particular I was most interested in: Introduction to SQL Server Big Data Clusters by Buck Woody. Buck's session hit on a lot of topics I don't know much about: Linux, PolyBase, Containers, Kubernetes, Spark, and HDFS. This was my second time seeing Buck speak. He's equally entertaining and informative. Another notable session I attended was Storytelling for Machine Learning and Advanced Analytics by Jen Underwood. This session also covered some topics I have an interest in, but not much personal experience. Jen's session was a "replay" on the one she presented at PASS Summit in 2018, which was nice for me since I didn't make to to Seattle last year. It was my first time seeing her speak. There was one session I went to where the speaker didn't show up. This gets talked about from time to time in the SQL community, especially amongst SQLSaturday organizers. A volunteer arrived after about 15 minutes to let us know the speaker wasn't coming. I felt bad for the volunteer, who seemed sheepish to make the announcement, almost as if he felt he had let us down. Obviously, it's not an ideal situation. But it's not the end of the world. Sometimes life gets in the way. I hope the speaker is safe and sound. There were less than 10 of us in the room. I wondered if any of the attendees would want to do something impromptu? The topic for the session is something I've had a few experiences with, including a recent one. So I asked the others if they wanted to tell a problem story about Topic X. Did they fix the problem? If so, how? If they didn't fix the problem, was there someone in the room that knew how to fix it or could offer some insight? I tried to get a conversation going a couple of times, but no one seemed interested. So I let it go. SQLSaturday Tampa opted for a catered lunch. It works well in their venue with the buffet/serving line in the main building adjacent to all the tables & chairs. It's hard to please everyone with lunch options, but I was a happy camper. Pork, chicken, beans & rice, along with some side items (yum!). I got to hang out with Buck for a bit, along with Jeff Taylor and Ron Dameron. I met John Wells for the first time. We just met online for the first time back in December and had mostly talked about college football. (His LSU Tigers were playing my UCF Knights in the Fiesta Bowl.) Like me, John's career with SQL Server and IT got started a bit later in life than many others. John attends and speaks at a lot of SQLSaturday events in a lot of different parts of the US. He's easy to talk to. Go say Hi to him if you get a chance. Robert Preseau and I went to a couple of the same sessions and got to hang out a bit. And there were many others in the #SQLFamily I bumped into. Staying up late and waking up early makes for a sleepy attendee. I'd gone through two energy drinks during the day. After the last session, I was drained. So I skipped the raffle and hit the road for the drive home to Seminole County. Despite some pockets of congestion on I-4, I made it home in time for a late dinner.